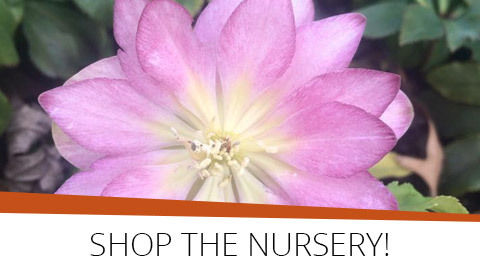 Placing an order on the Blue River Nursery website is easy. To find a plant or product you can use the menus at the top of the pages by category, you can put the name or part of the name in the search box. To access more information, either click on the image provided or the name of the product you wish to inspect. To purchase a plant or product, you must first add it to your shopping cart. You do so by clicking the ‘Add to Cart’ button. You can view your shopping cart at any time by clicking on either the ‘My Cart’ link in the top left hand of every page, or where shown in the right hand sidebar. To compare similar plants or products, you must first add them to your Compare list by clicking the ‘Add to Compare’ link shown with each product. To see the full comparison of your chosen products, click on the ‘Compare’ button in the Compare Products section of the sidebar. When you are ready to purchase the items in your Shopping Cart, you click the ‘Checkout’ button shown below the Shopping Cart. You will then be taken through a series of screens asking for the information necessary for us to deliver you order to you and for you pay for your goods. If you would like to create an account with us, you can do so in the first screen. If you are already a member and you are logged in, most of the information in the screens will be filled in for you. To access multiple shipping, you must be a member and logged in during the checkout process. In the last step of the checkout process, you will be asked to click the ‘Place your order’ button. Once you click this button, your order will be placed in our system and if necessary, you will be diverted to our bank gateway to finalise the payment. Before clicking the ‘Place your order’ button, please check the information you have entered: A summary is provided in the right hand column. Shipping and handling charges given during the checkout process are ESTIMATES only. Individual plants vary in size and weight. We will advise you within two business days, if the shipping is more than 20% above the estimate quoted. All plants and products will be shipped via FedEx unless otherwise explicitly specified. If an item is in stock at the time of order, it will usually be shipped within 3 business days of the receipt of your order. Our shipping days are Monday, Tuesday and Wednesday to avoid the possibility of your plants sitting in a warehouse over the weekend. If not in stock or no longer available, you will be notified within 2 business days of the receipt of your order. FedEx Services – properly completed orders received prior to 5 p.m. EST will be processed the next shipping day. FedEx Ground Service Orders are estimated to take 1-6 days to deliver; therefore customers can expect to receive their order in 2-9 business days, depending on the final destination. FedEx Next Day Air Customers can expect delivery 1 business day after the order is shipped. FedEx 2nd Day Air Customers can expect delivery 2 business days after the order is shipped. FedEx 3rd Day Select Customers can expect delivery 3 business day after the order is shipped. Note: We only shipped on Monday and Tuesday for 3rd Day Select. If we made a mistake and sent you the wrong order, we will not refund shipping and handling, however, we will send you a replacement, free of shipping and handling charges. If you choose the ‘Pick up from us’ option, we will notify you when your order is ready and arrange a time for you to call and pick up your order. We pride ourselves on the quality of the plants and products that we supply. To the best of our ability the plants you purchase are healthy, correctly named and hardy in zone 5 or even harsher conditions. Please read the Detailed Description and Additional Information provided for each plant. To protect your plant in transit, we package carefully and only ship on Mondays, Tuesdays and Wednesdays. However, we cannot be responsible for delays caused by problems outside our control. As computer monitors and screens differ, the actual colours of our plants and flowers may differ slightly to that shown on your computer. If you are unhappy with your plant or product for any reason, please call us within 2 business days of receiving your shipment. The Order Subtotal is the cost of all of the products in the shopping cart, which reflects any discounts. The Order Subtotal excludes shipping, taxes and promotion codes. Shipping charges are calculated after all discounts and promotion codes have been applied to the order. If the Order Subtotal qualifies for Free Ground Shipping, any promotional codes or discounts applied will reduce the Order Total and may not qualify for free ground shipping unless additional item(s) are added to the order. Blue River Nursery collects sale tax on all orders placed in its store. Blue River Nursery does not accept tax-exempt orders at this time. Gift Certificates always ship for free. If you are buying Gift Certificates, the value of the certificates will apply towards the Order Subtotal. If you are redeeming Gift Certificates, this will not impact your Order Subtotal (they apply as a form of payment against your final Order Total). To view orders, you must create and login to your account with us before your purchase is completed. You can login in at any time by clicking the ‘Log In’ link in the top right corner of each page. When you choose to checkout, you will also be given the opportunity to log in or create an account with us. Once your products are ready to ship, we will send you an email containing a tracking number which you can use to track your parcel(s) via the member area. To update your account information, you must log in. You can update all or part of the information stored, at any time. As well as your own payment and shipping addresses, you can store up to 5 other shipping addresses and use these during the checkout process, enabling to ship up to 3 different address on each order. When you create an account with us, you are also able to create and store a wishlist of items, and review our plants and products. Blue River Nursery collects personal information that you provide when you register with us or use our services. Blue River Nursery may also collect information about your transactions with us. This information might include information necessary to process payments due to us from you such as your credit card number. Blue River Nursery automatically receives and records information on our server logs from your browser, including your IP address, cookies, and the pages you request. This information is collected for our use only to enable us to provide you with the products or service you request. We will under no circumstances provide this information to a third party unless it is required to complete your payment transaction. A cookie is a small amount of data, which often includes an anonymous unique identifier that is sent to your browser from our web site’s computers and stored on your computer’s hard drive. You can configure your browser to accept all cookies, reject all cookies, or notify you when a cookie is set. However, if you configure your browser to reject cookies, you will not be able to use our services that require you to “log in” and you will not be able to purchase products on our website.